In the bowl of a food processor, pulse 10 graham crackers with 1 Tbsp sugar and 2 Tbsp cocoa until you have fine crumbs. Melt butter and pour it into the chocolate cookie mixture. Pulse a few more times or until crumbs are evenly moistened. Press cookie mixture evenly over the bottom of a 9" springform mold going 1" up the sides. Bake at 350˚F for 8 min. Remove from oven and cool to room temp. How to Make the Cheesecake Portion: Preheat Oven to 450˚F. Beat together 5 softened sticks cream cheese with 1 1/2 cups sugar on medium/high speed for 5 minutes, scraping down the bowl halfway through. Turn mixer down to medium speed and add eggs, one by one letting them incorporate fully before adding the next egg. Scrape down the bowl well and continue mixing on medium speed another minute or until well blended. Turn mixer down to low speed and add 1/4 cup sour cream and 1/2 Tbsp vanilla. Mix until well incorporated. Pour the cheese cake mixture over your cookie crust. Place the middle oven rack one level lower so it is in the bottom 1/3rd of the oven (In my oven, it's on the third shelf). Bake at 450˚F for 15 minutes then (without opening the oven door), reduce oven to 225˚F and continue baking another 1 hour and 5-10 minutes or until the center is almost set (it should barely wiggle on top when you give the pan a little jolt). 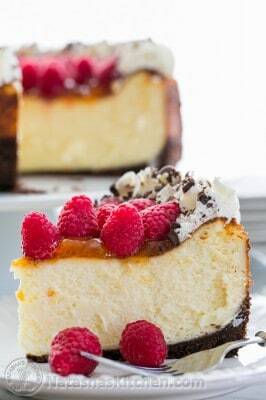 Cool cheesecake to room temp then refrigerate until fully chilled; at least 4 hours or overnight. Warm up 3/4 cup of apricot preserves in a small saucepan just until it loosens up a little. You don't want it to get hot. Let it cool down until it's just warm then spread it over the top of your cheesecake leaving a 1-inch border. Arrange Raspberries over the surface of the apricot preserves. Beat 1/2 cup cream together with 1 Tbsp sugar on high speed until stiff. Pipe frosting around the top border of the cheesecake. I also sprinkled shaved chocolate over the frosting. I've had the best results when I did not open the oven door to look at the cheesecake in the baking process. About 90% of my cheesecakes are crack-free. Occasionally I'll still get a tiny crack but it doesn't matter since you'll be covering the top with the apricot preserves and raspberries. It will be delicious either way. I love making my cheesecake the night before an event and decorate the next day. Cheesecakes are best served cold.